Join KCET and Curbed's Hadley Meares as we tour the curious Portal of the Folded Wings at the edge of Burbank's sprawling cemetery, Valhalla Memorial Park. Constructed by Valhalla's corrupt founders (whose dirty deeds will be discussed in detail during the tour), the Portal was first built as an entrance gate to the cemetery and was later re-purposed as a memorial glorifying many of aviation's most daring pioneers. We will learn about the Valley's early role in aviation and tell the inspiring stories of aviators interred or honored here. Notables include Matilde Moisant (second licensed female pilot in the US), Elizabeth Lippincott McQueen (one of LA's first female pilots), Charles Edward Taylor (machinist for the Wright brothers) and of course, Amelia Earhart. 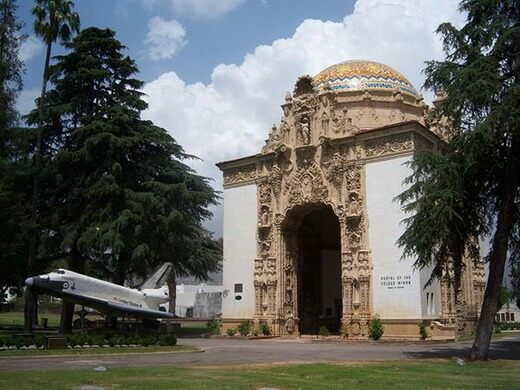 - This tour will focus exclusively on the Portal of the Folded Wings Shrine to Aviation section of the cemetery. We’ll be ending around 12:30 pm but we encourage you to stay after to explore this vast park on your own. - This is an active cemetery, please be respectful. - Parking instructions will be sent out the week of the tour. Advance tickets only. All sales are final.